Nowadays digital market grows like a house on fire. And a wide range of platforms of your choice can’t leave merchants unfazed in a fact they are on the look-out for a suitable shopping cart. Today we are going to outline two well-known solutions that have conquered their niches and suggest the feature-rich possibilities for managing online business. 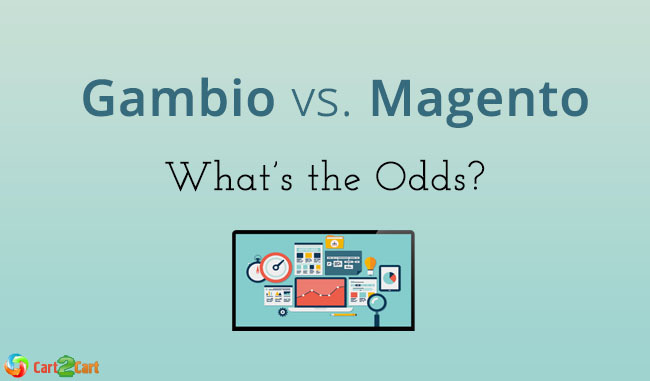 Thus, which platform opt for: Gambio or Magento? Gambio is a flexible shopping cart that powers over 18 000 e-stores and has already gained popularity on German e-Commerce market. And its rival is Magento, a platform which has 26% of market share, and provides a killing functionality for retailers around the world. It seems to be ridiculous to compare these two solutions, however, believe it or not, both of them have their powerful pros and deplorable cons. Regarding the cost, difference between platforms is considerable. As it is obvious, they require some money expenses. Magento is an open source that appears to be absolutely free for download. However, it does not provide a hosting, so you need to find a provider and, of course, you need to front all hosting spendings on your own. Concerning Gambio, this shopping cart costs €149 and can be bought for one-time. Your e- shop is not going to be connected with any other expenses or limited in functionality. Therefore, you don’t have to expect any hidden fees. Helping to create a unique store front that can attract customers, Gambio allows to customize template and style of your shop with no technical expertise. You are able to modify colors, fonts, change logos and backgrounds using the back end. It means that there is a possibility to make the store look catchy avoiding editing the source code. Magento also tries to meet clients desires, offering many bright themes and opened core code. But the bottleneck is that not everyone can cope with its complexity. So, if you have no programming skills, it may be a challenge. There is no doubt that Magento has more options that can satisfy your demands. However, in case you own small or middle-sized store, then those basic features, offered by Gambio are going to be completely enough. As Magento target audience includes mostly large retailers, its possibilities have to correspond accordingly. That’s why this solution provides a multi-store function allowing to create two or more stores and manage them via the only administrative panel. In turn, Gambio provides a multichannel trade enabling selling your products directly from the shop out via external marketplaces. Orders will be automatically imported back into the store and processed as usual. Both platforms don’t limit the number of products you want to add to your store. Magento and Gambio developers deeply understand the necessity to follow latest trends and go in step with the times. They offer responsive designs, making possible to shop using tablets and smartphones. “Gambio MobileCandy” template and Magento mobile version strongly help to smash the success in your trade. Powerful SEO features are the point both solutions can boast. Regarding support, Gambio offers an opportunity to get in touch via phone and email. Also, you can use their official forum to ask a question or find the answer on 300-page documentation. As for Magento, it has the largest community that counts over 800 000 merchants that are always ready to help on its forum.